It’s a pretty hilarious way to nerd rage, but if you live in a smaller community, it won’t be long until your neighbors uncover your anonymity. But in a city like New York where you can find at least 15 networks in a single location, or a college dorm where kids are constantly sending sneaky messages between their hall-mates, the rise of this trendy expressionism sure beats leaving Post-It notes at your neighbor’s door. People have also been using Wi-Fi titles as a way to express allegiance to a certain causes, such as political parties or veganism. A recent study by OpenSignal reveals that New York City alone contains pretty mixed voters, from Wi-Fi names like “Obama4President” to “ImpeachObama.” It’s another way the Internet provides a space for people to say what’s on their mind without the awkward confrontation, unless you’re that fed up and feel the need to barge over and scream at your neighbors in real life. 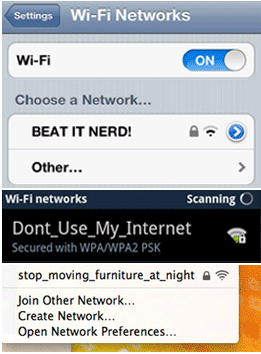 Have you had any experience with ridiculous Wi-Fi names? My college friend certainly has, when he named his Wi-Fi network “Free Public Wi-Fi” only to password protect it. I’ve also spotted pretty bizarre names from “WhatsWrongWithTwoGirlsKissing” (with the password being “nothing”) to “Go Away.” You’ve gotta admit, however, that these passive aggressive names are pretty inspirational. I might go home and change my Wi-Fi name now.